Calling all recent graduates! 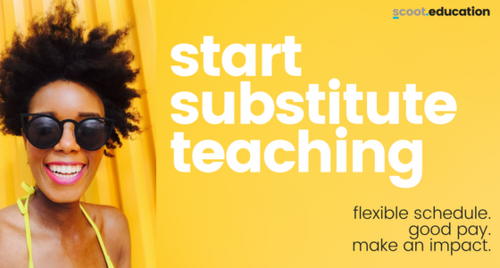 Consider substitute teaching as your next step! There’s a teacher shortage in California. At Scoot Education, we’re aiming to solve that problem by empowering recent graduates to get in the classroom and provide a day of continuous learning. If you’re pursuing a career in education and working to get your credentials, or you were a high-performing and driven college student--we want to talk to you! We understand as a recent graduate it can be difficult to complete all of the requirements for graduate school and accreditation while affording to pay the bills! Why not get classroom experience and get paid for it? We’re eager to see upcoming leaders, like you, begin gaining valuable experience in the classroom now! Consider becoming a substitute teacher with Scoot. We’ll guide you through the process and get you working in schools by fall 2018! You will be an official employee of Scoot and benefit from the perks associated and so much more!